The 4th of July might be one of your favorite holidays with spending time barbecuing or having fun with friends and family. You might be stoked for the night’s fireworks display, or you might want to shoot off some fireworks for yourself. 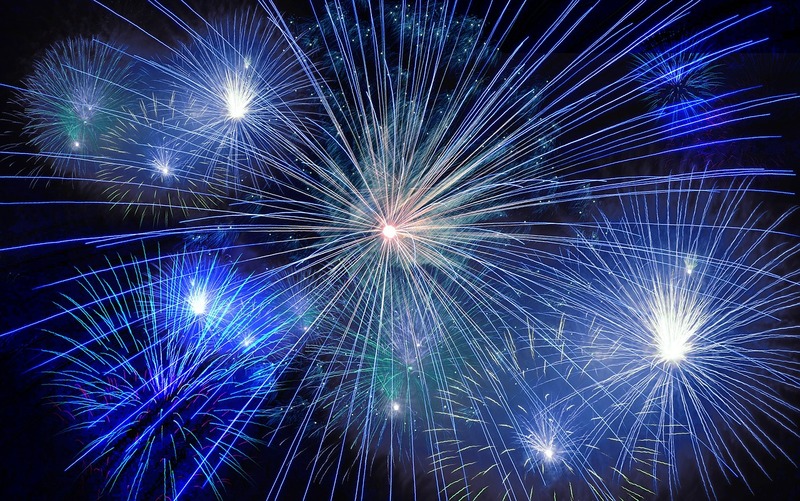 Fireworks, traditionally, are supposed to be loud and simulate the feeling and noise of being on the battlefield — hence why some fireworks explode with a huge boom and others sound more akin to gunshots. While we understand what these fireworks are, your dog won’t. Shelters and veterinarians report an uptick in dogs that they find if they escape their home, fences, screens, or windows because they are simply terrified of the showy sounds and display of fireworks. Your dog might hate thunderstorms, too, and some of the training tips we’re going to share with you might help also when a thunderstorm comes. Make sure your dog is wearing a properly fitted collar with an up to date license and rabies tag. Talk to your vet about having your dog micro-chipped if he hasn’t already. If you don’t have a tag for your dog, run down to your pet store and get a quick tag made with at least a phone number on it. Keep your dog in a safe and familiar place such as a crate or a bedroom. Close all windows and doors to lessen the sound and to ensure that there are no possible ways for him to escape — make sure that you close windows so your dog doesn’t try to push through the screen of your window. Put on something such as a TV, radio, air conditioner, or something else that produces noise to help lessen the focus on the sounds of the fireworks. Remember not to turn it up too loud — your dog’s hearing is very sensitive! Try using a calming treatment such as Comfort Zone. Comfort Zone plugs into any outlet and releases the same pheromones that a mother dog releases to calm her puppies, and may help your dog relax. You can also try a Thunder Shirt or Bach Rescue Remedy. Give your dog an article of clothing or blanket that has your scent on it, especially if you can’t be there with your dog. The smell of his owner will help calm him. Don’t leave your dog outside if you know there may be fireworks. Even if you have a fenced in yard, tether, or invisible fence, if she gets scared she may try to escape and can injure herself. Stay calm and relaxed around your nervous dog. Your dog reacts to your mental state, so try not to get worried about him. Distract your dog with a game of fetch, hide and seek, or ask her to do some tricks to keep her busy and stimulated while you can hear fireworks. You can also stuff treats in a toy to help keep her occupied on something else other than the fireworks. If your dog’s anxiety tends to be severe during the 4th of July, call your vet and discuss possible medications that will help calm him. Last but not least, you should avoid taking your dog to a fireworks show, as the sights and sounds can be overwhelming to your dog. Plus, if he or she gets lost, they will be in a new area and scared, which might not spell great odds for being able to find them again. Better to leave your furry friend home where they can be safe and comfortable.